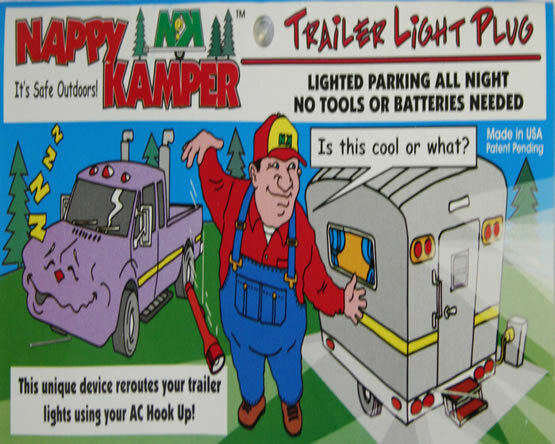 Nappy Kamper by AP Products - Trailer Light Plug. Light up the immediate area around your campsite using your trailer's running lights and stumbling around in the dark is a thing of the past! Easy and safe to use, this power rerouter uses your trailer's existing power coupling making it safer to navigate your campsite after sunset. Let your truck take a nap while your Trailer lights it up for you! Save those expensive batteries in your flashlight for emergency uses. Your trailer Light Plug also has the additional benefit of acting as a weather cap for your trailer's power coupling to help keep it safe from weather damage even when the plug is not in use. Simply pull the plug far enough to deactivate the trailer lights, but do not remove.